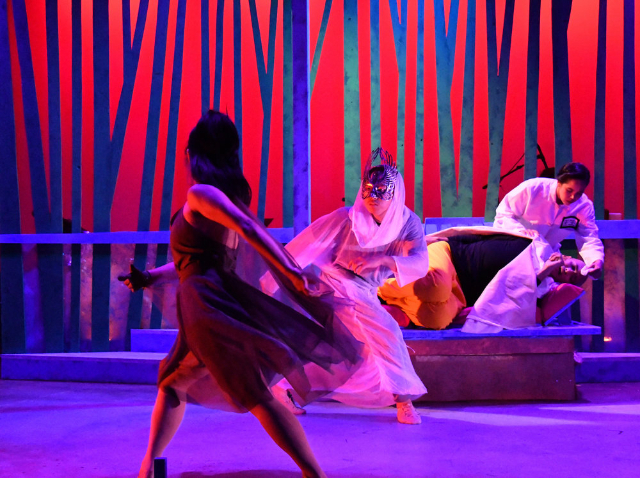 Isabel To as Mei, Pauli Amornkul as Nightingale, Matt Ono as Xiao (foreground). Ji-Yun Kim and Chelsea Wellott as ensemble (rear). All photos by Jay Yamada. 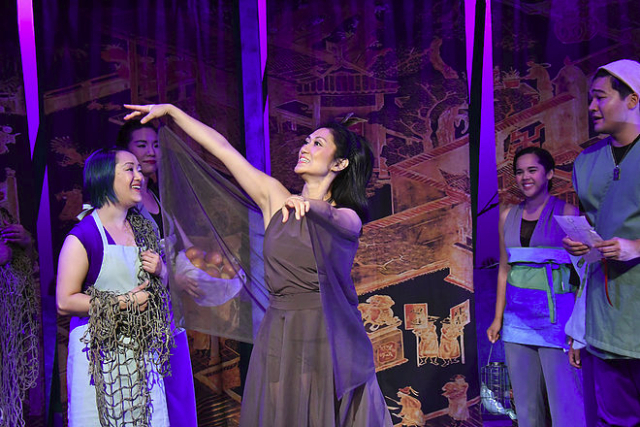 Ted Bigornia as Bing, DC Scarpelli as Emperor, Isabel To as Mei, Lisa Woo as Madame Wu (Emperor’s sister). The Song of the Nightingale is comprised of numerous clashes – the well being of the poor fishermen who must provide fish for the Emperor’s banquets versus the pleasure of Emperor; the needs of the Emperor’s sister who is the brains behind the administration versus the ego of the Emperor; and the young fisherman Xaio versus the girl that he loves, Mei, who aspires to higher goals and has been lifted from the fishing village to become a maid in the palace. The tale is told with great charm and humor and with shades of modernity that keep it fresh, especially for younger audience members. Every melodious song tells its own little story from the Emperor’s “It’s Lonely at the Top” to Xiao’s “The Girl I Know.” The idiom of the music is typical of Broadway musicals, with Chinese influence absent, except perhaps in the flute solo of the Nightingale motif. While the singing of the Town Hall Theatre principals is not consistent, it almost always satisfies. The ensemble pieces, however, are all balanced, rich in harmony, and well sung. The playwright is a Bay Area product whose The Four Immigrants just completed its world premiere run at TheatreWorks. 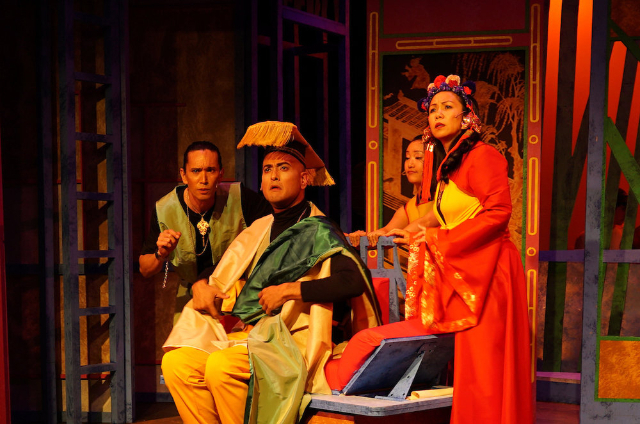 This work premiered at Alameda’s Altarena Playhouse in 2013, and several of the performers reprise their roles in this production, including Isabel To as Mei, the stalwart DC Scarpelli as the Emperor, and Christopher Juan as the Fake Nightingale. 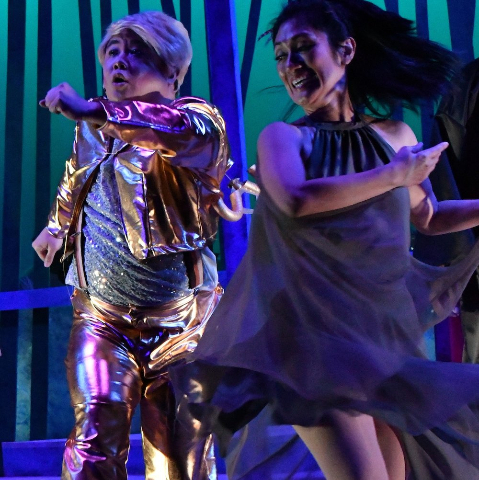 Matt Ono appears as Xaio, while Pauli Armonkul delightfully dances the title role, well choreographed by director Michael Mohammed. Each part is played with enthusiasm and conviction. Sets, which are dominated by sliding panels reminiscent of coromandel lacquer screens, and costumery reflect the Chinese origin of the action. Posted courtesy of Victor Cordell.